The word “Flux” is derived from the Latin word “Fluxus”, which means “to flow”. So when SteelSeries sent us a box with the phrase “Flux yourself” printed on the front, we weren’t sure if it’s a compliment or an insult. 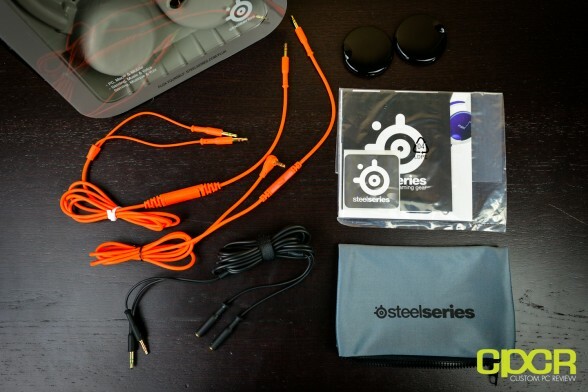 Luckily, the box contained more than just random words – inside we found SteelSeries newest addition to their ever-growing audio line-up, the SteelSeries Flux Luxury Edition, for our review. So what makes the Luxury Edition of the Flux luxurious? Several factors. The biggest difference is the earpads. 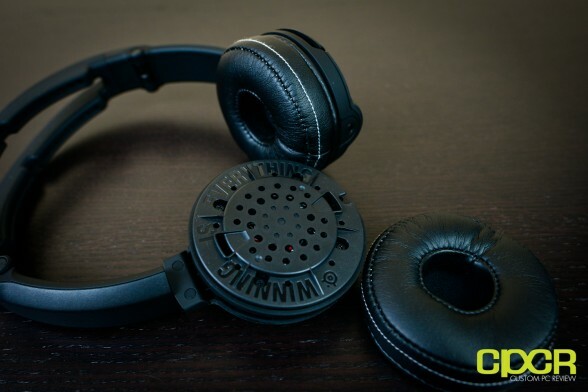 Instead of using the SND Sound Block earpads (which we love, by the way) found on the original Flux, the luxury edition comes with pleather earcups. 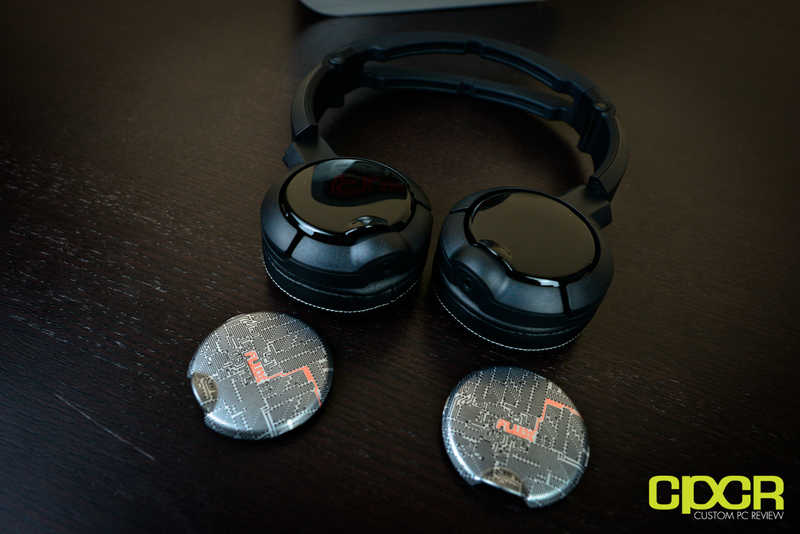 Other differences include an orange cable and a set of exclusive silver earcup covers. 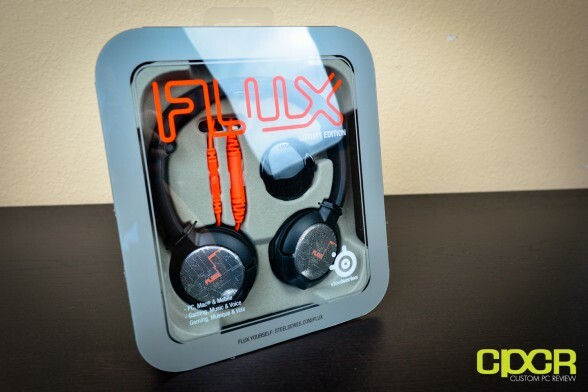 But the Flux Luxury Edition is still a Flux at the core. It’s still got the same 40mm drivers, same on-ear earcups, and the same sleek frame designed to be hung around your neck all day long. 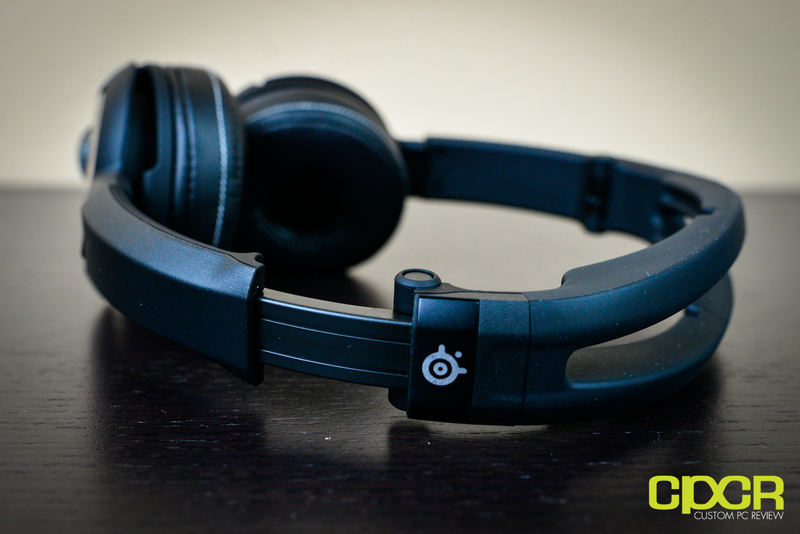 Will SteelSeries’ first true mobile headset be a majestic symphony or a royal flux up? Let’s find out! Here’s a look at the front of the box. Go Flux yourself. The Flux Luxury Edition is decked out with accessories. Included in the box are two connection wires; one for the PC, which has both the 3.5mm microphone jack and the 3.5mm audio-in jack, and another 2 in 1 cable for your MP3 player/Phone. Other accessories include an extension cable, a pair of replacement earcup lids, a documentation package, and a neat little carrying bag. Taking a look at the headphones themselves, the first thing we notice is that there are headphone jacks under both the ear-cups, both of which may be used to connect to the audio jack. Of course, the two audio ports are more than just for convenience. You can plug another pair of headphones into one of the audio ports and share the audio, which is great for those who find it difficult to fit two heads under a single pair of headphones. For better portability/storage, the earcups can be swiveled 90° to face down. I guess it also helps the headphones hang around your neck more comfortably as well. The headband size can be adjusted by pulling down on the ear-cups There are no notch labels to indicate how long you’ve pulled it, but it allow for some really fine adjustments. The headrest of the Flux doesn’t come with any padding. Instead, SteelSeries attached some soft rubber fins on the bottom to alleviate discomfort. Although this type of headrest is much more durable that the conventional pleather padding, it also raises some comfort concerns when used for extended periods of time. The force that drives the ear-cups is a pair 40mm drivers. The ear-cups come with ultra-thick pleather cushions that look stylish and feels quite soft. The cushions can be easily removed and replaced with cloth earpads (not included). The Flux also incorporated a folding design for convenient carry. Folded up, its size shrinks by about two folds and can almost completely be covered by my hand. 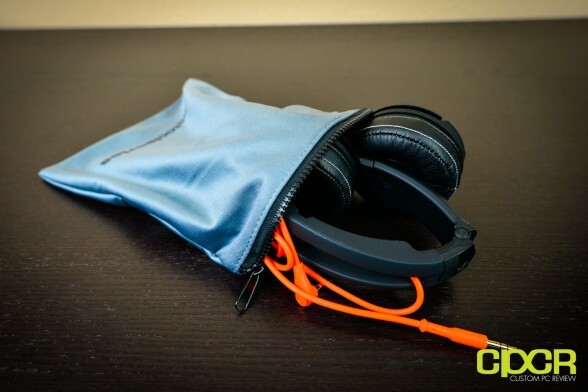 Both the headset and the cable can be stored away inside the travelling pouch. The pouch feels like it’s made out of a combination of nylon/cotton. There’s even a zipper up top to keep things from falling out. Unfortunately as it is a soft case, it won’t provide the best protection, but it is an included accessory after all and I’ll take whatever I can get. The ear-cup lids can be popped off with your nails quite easily. It’s held in place with a piece of magnet in the center. With the “luxury” edition lids gone and the replacement black lids in place, the Flux takes on a whole new look. My testbench of choice for this category is non other than EA’s first-person shooter Battlefield 3. For a headset with 40mm drivers the sound effects were truly exceptional. Explosions sounded powerful, and gunshots were satisfyingly crisp . The high pitched ringing that your character hears after a grenade goes off next to him were accurately outputted with no distortions. During quiet moments, ambient sounds were clearly heard. No noise/distortion were heard at all sound levels (treble, mid, bass). Surround sound is average. Judging distance and enemy positions with the element of height was difficult. In this test category, I fed the Flux a ton of FLAC, and it happily ate them all up. Everything from treble to bass was incredibly satisfying. It had no problems handling high and low notes in classical and orchestra pieces. In bassy dub-steps, the drivers produced thumping, powerful bass. Although the treble and bass are powerful, they did not drown out the ever so important mids; voice of singers were still brilliant. 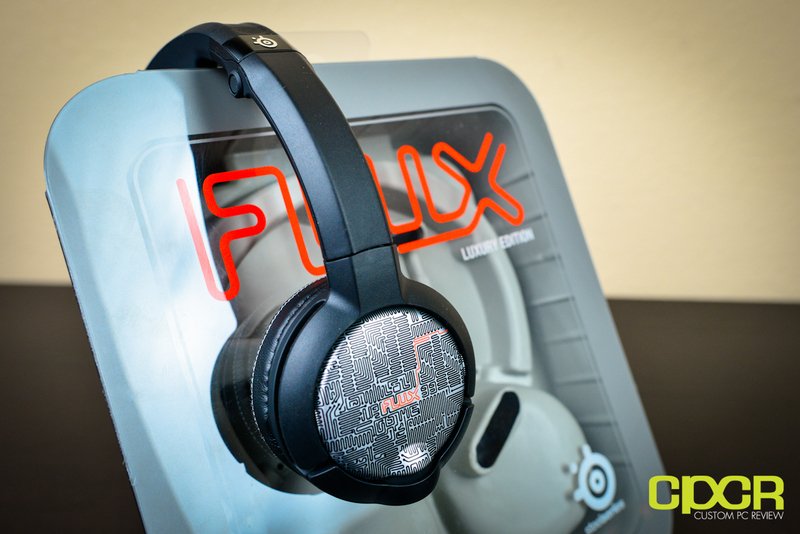 The Flux was also quite loud compared to many other headsets and earphones. Noise insulation was adequate for music listening in a outdoor environment, but not enough to enjoy music on the bus. One negative I discovered is that the Flux sounded a bit muffled. This wasn’t apparent to me until I listened to music in an extremely quiet environment. Identical to the music test, the Flux shined in the movies test as well. As usual, I ran it through the explosion-filled Mission Impossible 3 and the dialogue heavy WWII film Valkyrie. In both tests, the Flux delivered phenomenal results. Explosions in MI3 sounded deep and realistic. Gunshots, tire screech, and other high pitched sounds really rattled my eardrums. Dialogue in Valkyrie was clear and distortion-free, which boosted the experience of the film. Despite being an on-ear headset, the Flux Luxury Edition’s super thick earpads cushioned my ears extremely well. Although the headrest didn’t include any padding, the upright rubber flaps kept the cap of my skull relatively pain free thanks to the featherweight chassis. But since the earcups are made from pleather, they made my ears exceedingly hot after awhile. This was problem was alleviated by taking the headset off for a brief moment. The tiny in-line microphones integrated into the wires were surprisingly pleasant to use. Every word I spoke on Skype passed through clearly. I also detected no distortions or static. The Flux Luxury Edition certainly lives up to its name as a classy headset in terms of appearance and I felt it did quite well under the hood as well. 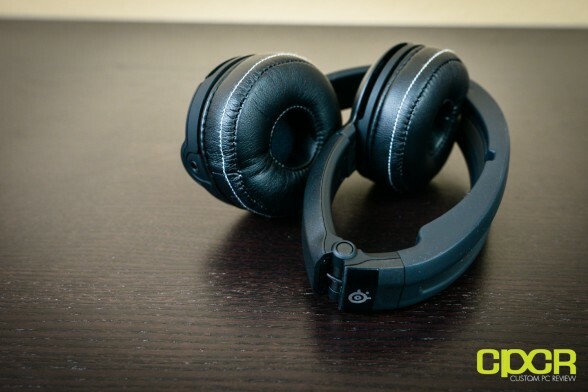 It’s more than evident that SteelSeries was keen on portability with the Flux; things such as the fold-able design and on-ear earcups made this headset a neat little device that can be stuffed into the fullest of backpacks. The fully detachable cables also help to keep the headset on your head, where it really matters. Unlike some SteelSeries products I’ve used in the past, the build quality of the Flux is pretty good. 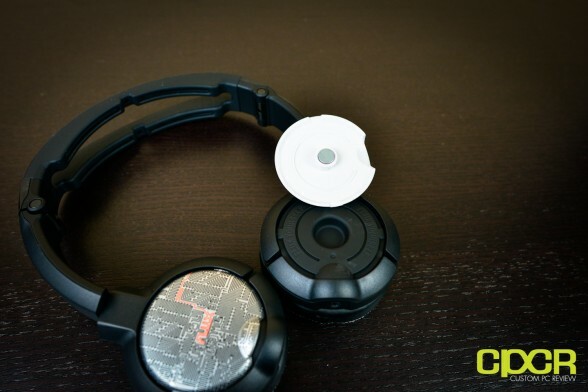 The hinge feels extremely sturdy, and the plastic that went into the earcups is of very high quality. 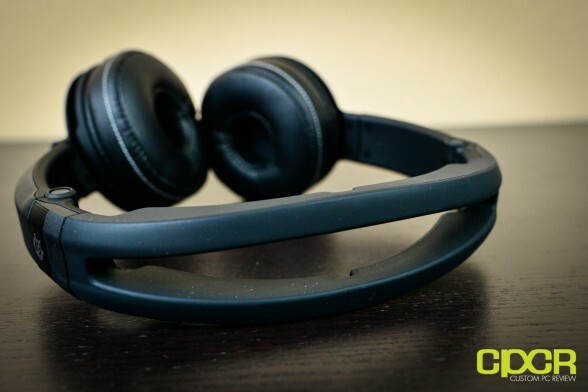 I initially thought that the headset is constructed out of pure plastic, but upon a more careful inspection, I discovered that it’s actually a metal band wrapped in rubber. The metal band increases the toughness of the headband, while the rubber layer adds extra resilience to impact. The fully detachable cable will protect the headset from fall damage when accidentally pulled. Kudos to SteelSeries for keeping build quality high while still managing to keeping the weight low. 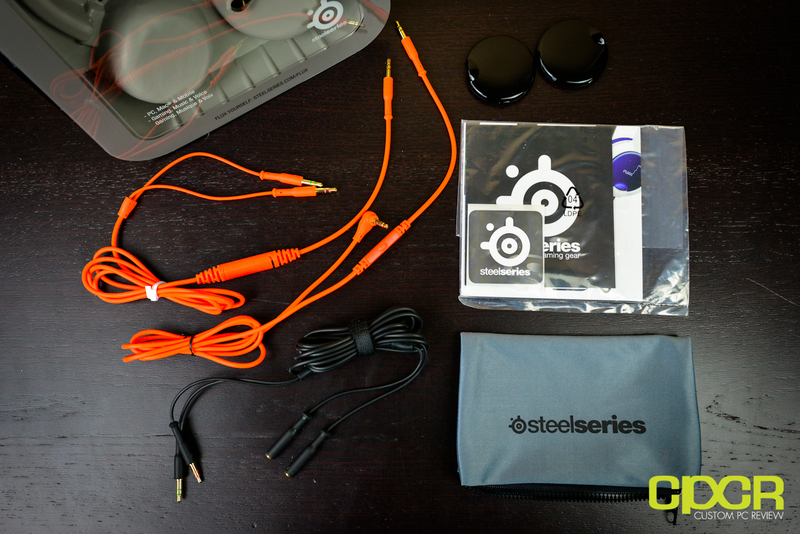 It’s very apparent that SteelSeries has designed the headset with portability and flexibility in mind. 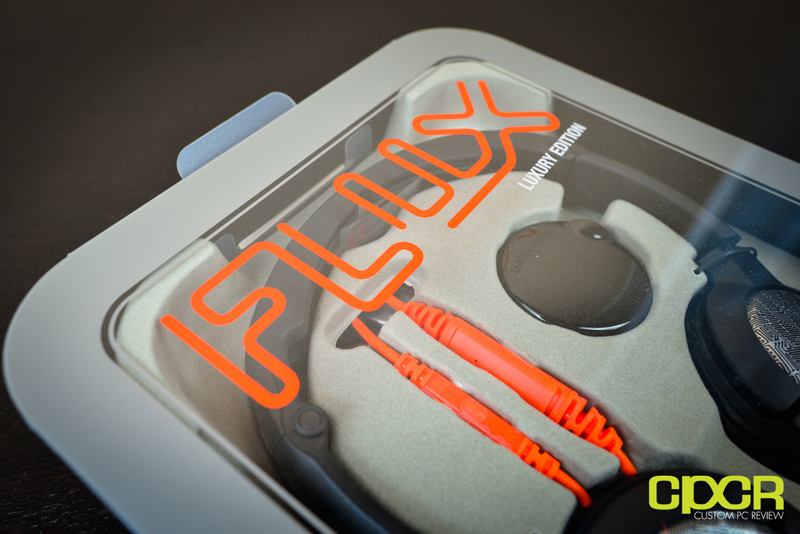 Sound quality is obviously the main deciding factor of any audio equipment, and the Flux doesn’t disappoint either. Despite having smallish 40mm drivers, it delivered fantastic sound quality. In my music test, it had no problems handling trebles when high notes started flowing in classical music, and was equally capable of pushing out thumping bass in dubsteps. Audio drown-out isn’t a concern with the Flux either, even as percussion played in the background in my music test the mids were still enjoyable. The pleather earpads does a good job at keeping low-level noise at bay, but isn’t sufficient enough to keep the rumbling of a bus engine out of my music. The one real disappointment is that the Flux sounds a bit muddy in quiet environments. The muddiness isn’t as much as a knife wound as it is a paper cut, but I expected a little better out of a premium grade headset. Test results from the movies test agreed with the music test, which equates to a very enjoyable experience. Gaming definitely isn’t the Flux’s forte. Although it’s capable of delivering some pretty good audio out of a very small package, I found that directional sound is lacking. If you’re planning on doing any sort of intense gaming, it may be worthwhile to invest in a true gaming headset with larger drivers that’s more comfortable overall. My best recommendations? 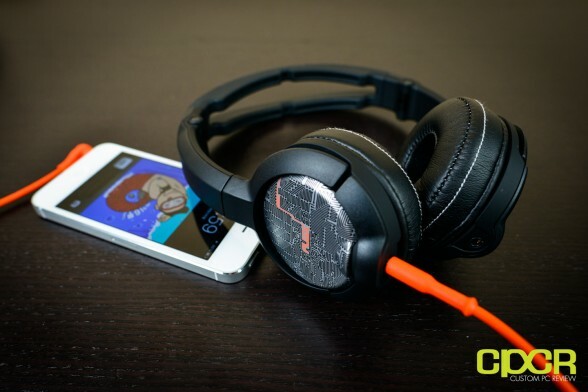 Check out the SteelSeries 7H Fnatic, Corsiar Vengeance 1300, SteelSeries Siberia V2, or the Razer Tiamat 2.2. All these would be better suited for long term PC gaming, but they do lack the portability and versatility provided by the Flux. 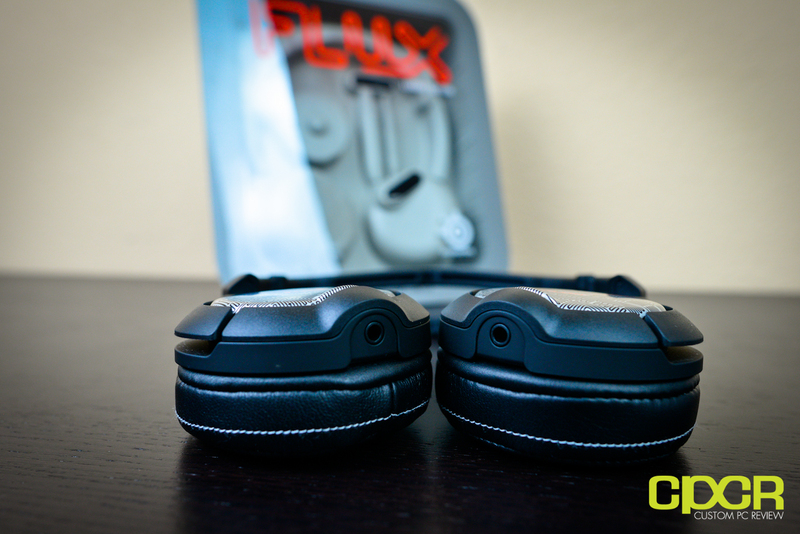 The on-ear ear pads of the Flux were a lot more comfortable than I expected – and hot. For short-term wear it feels like a set of pillows. No, really, I wouldn’t be surprised if I saw you sleeping on one of its ultra-thick, super-soft pleather ear pads. That said, you should be warned as your nap will be short lived. The ear pads will become quite hot and uncomfortable after about 30 minutes of use in room temperature. Sure you can take them off to douse the flames, but do you really want to do that in the middle of your favorite song? Rather than the pleater earpads going on the Flux Luxury Edition, I’d much rather have the SND Block earcups. I’ve previously had great experiences with that on the SteelSeries 7H Fnatic, but it’s quite strange SteelSeries decided to put pleather on the Flux Luxury Edtion. On a good note, it’s extremely light, so it won’t make your neck hurt and the rubber headrest did a good job at keeping my skullcap pain free. The near invisible in-line microphone that’s attached to both wires was actually a lot better than I expected since I haven’t had much luck with SteelSeries microphones in the past. Skype chats sounded loud, crisp and clear and the microphone connected to my iPod running through Skype didn’t skip a beat. One thing I would have liked to see is some sort of clip that holds it in place so it doesn’t fly around everywhere when you are in the middle of an online meeting. Then again, it would look kinda silly for those walking around with the Flux, so I guess it can be forgiven. So if you’ve read everything up until this point, then you should have a pretty good idea of just how well this headset performs, but there’s one final factor that may affect your decision – price. If you want your ears to cuddle with the SteelSeries Flux Luxury Edition, be prepared to shell out a hefty sum of $129.99. That’s quite a hefty sum to pay, but for those who don’t necessarily need the extras that come with the luxury edition may opt for the SteelSeries Flux standard edition, which can currently be found on Amazon for $89.00. Personally, I’m a huge fan of the look of the luxury edition ear-cup lids and the orange cabling, but I’m not so sure about the pleater earcups. The specifications on SteelSeries website make it seem like the Flux Luxury Edition includes a pair of SND Block earcups, but it definitely wasn’t included in my sample. The SteelSeries Flux Luxury Edition is an excellent companion for music lovers on the go looking for a sturdy and great-sounding set of cans with a capable microphone. The real selling point with the Flux Luxury Edition is the fact that it’s so versatile. Those looking to purchase a single pair of headphones to use for gaming, listening to music, hands free calling, etc. will all find a little something in the Flux. 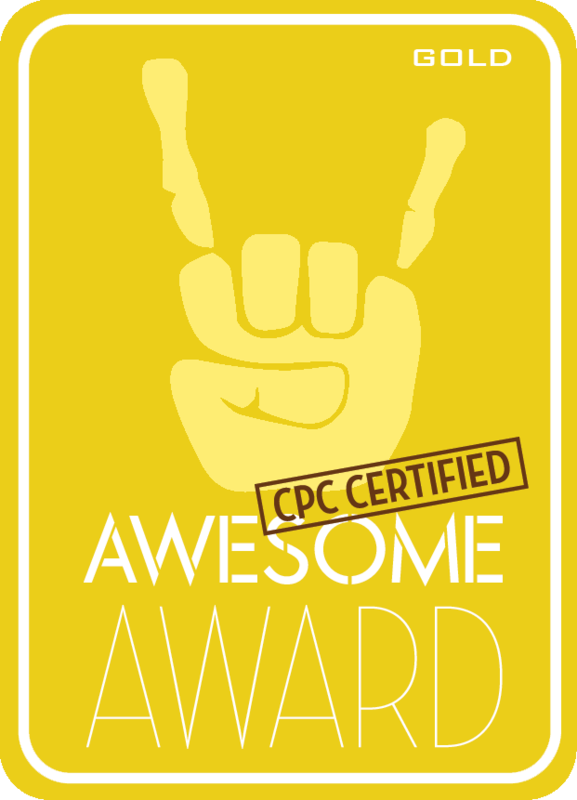 Special thanks to SteelSeries for making this review possible! The SteelSeries Flux Luxury Edition is currently available on Amazon. I must say that compared to the much more expensive beats solo that these were more comfortable and sounded great but I am still not someone who would purchase on-ear. Also the folding/carrying feature of these headphones was a bit wierd, they fold but not to a super compact form. I would just wear them open around my neck instead. I’m thinking of getting over the ear headphones. Debating if I should get the Bose QuietComfort 15 or not:/ Also trying to buy CDs instead because they have much better quality. Nope. Not worth it unless you’re planning on doing all your listening in loud environments (Plane, office with loud AC, train, etc.) since the Quiet Comfort series are active noise cancellation headphones. Try something like the Beyerdynamic T70 if you want something amazing.